The quality of the water used to spray the product is one factor that doesn't get much attention for effective pesticide applications . Research clearly shows that the quality of water used for spraying can affect how pesticides perform. 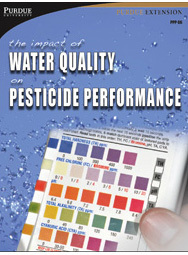 This publication describes how to test your water quality for better performance of your pesticides.